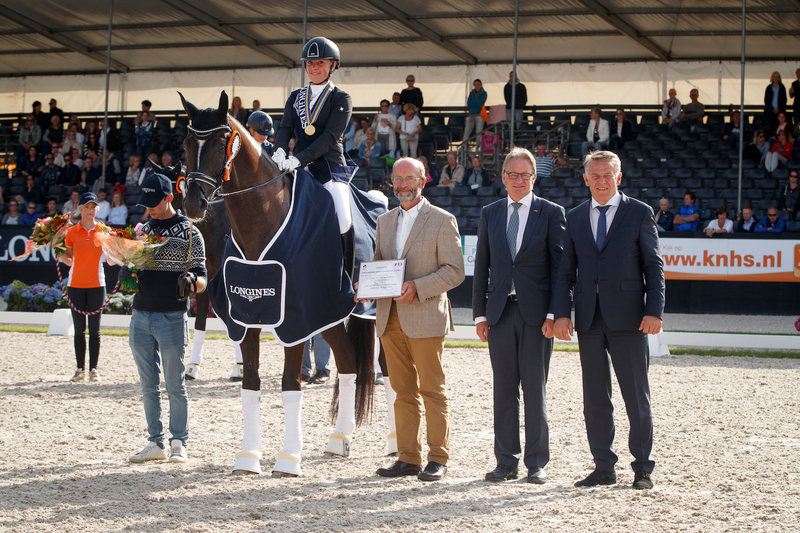 ...and the fabulous mare Fiontini showed she has plenty of that when adding the 7-Year-Old title to her two previous victories at the 2017 Longines FEI/WBFSH World Breeding Dressage Championship in Ermelo, The Netherlands. These Championships, supported for the second year by Longines, are designed to highlight the sometimes still raw, but often spectacular, potential of equine stars in the making, and to recognise the immense skill and commitment of the people who breed the greatest Dressage horses on the planet. The judges are looking for flair, for that “look at me!” quality that sets the special ones apart from the rest, and for purity and lightness in movement. The weather did its best to add to the challenge with storms, wind and rain along with sunshine, but nothing was going to stand in the way of a week of great sport. 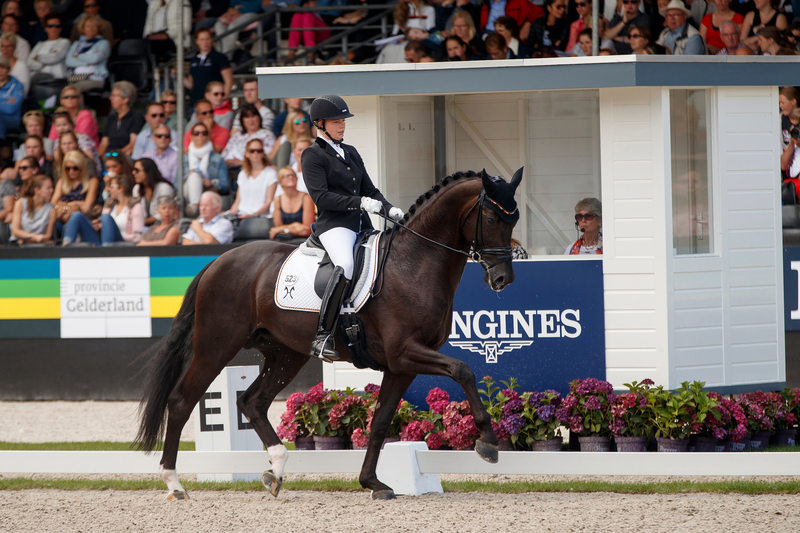 The Danish Warmblood Fiontini was bred by Hanne Lund and Henrik Hansen and was sold last year to Swedish young rider Beata Söderberg. But it was Spain’s Severo Jesus Jurado Lopez who steered her to victory in the 5- and 6-Year-Old categories in 2015 and 2016, and the 28-year-old rider was back in the saddle to do it once again this year. “Fiontini has three gaits that are to die for and I had the pleasure of judging her last year as well. I absolutely fell in love with her!”, said South African judge Sharon Rhode. Only one other horse has ever won the three-in-a-row, the Danish Warmblood stallion Sezuan. Fiontini scored 85.656% for gold, but the silver-medal-winning Hannoverian gelding Sultan des Paluds, owned and bred by SCEA du Vieux Capeau and ridden by The Netherlands’ Kirsten Brouwer, was close behind on a final mark of 83.515. 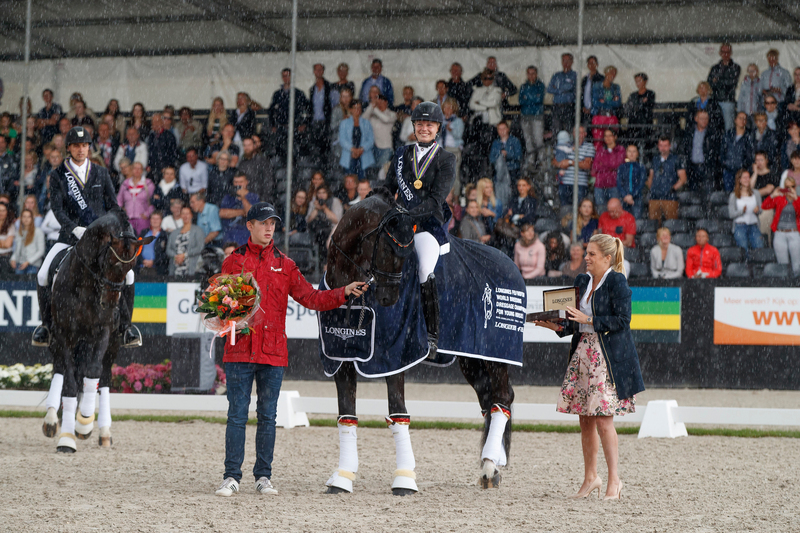 Denmark’s Anne Troensegaard guided the Trakehner gelding Kipling, owned and bred by Peter Christensen, into an even closer bronze medal spot when scoring 82.445%. 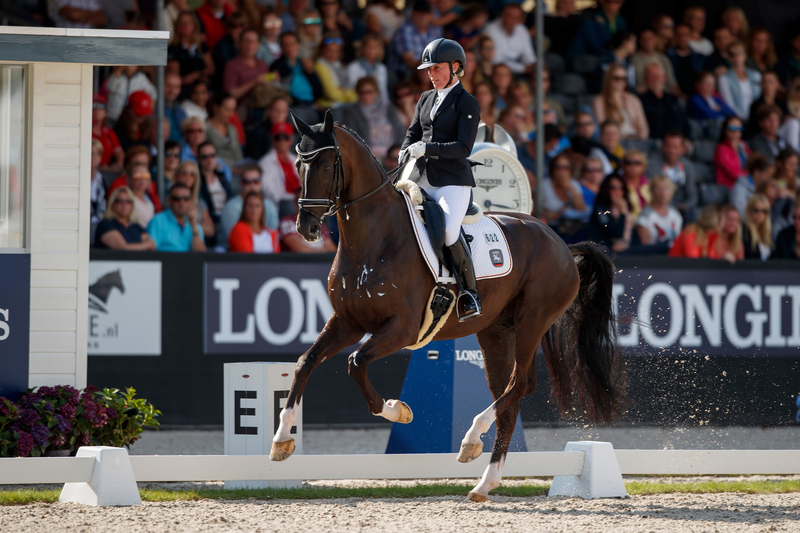 A perfect 10 for Walk went some way towards sealing the 5-Year-Old title on the final day for the Hannoverian stallion Don Martillo ridden by Germany’s Ann-Christin Wienkamp. Their overall total of 9.74 points saw them pin the Oldenburg stallion Ferrari, ridden by Denmark’s Andreas Helgstrand, into silver medal spot on a score of 9.2 while fellow-countryman Jan Moller Christensen clinched the bronze with the Danish Warmblood stallion Hesselhoej Donkey Boy. 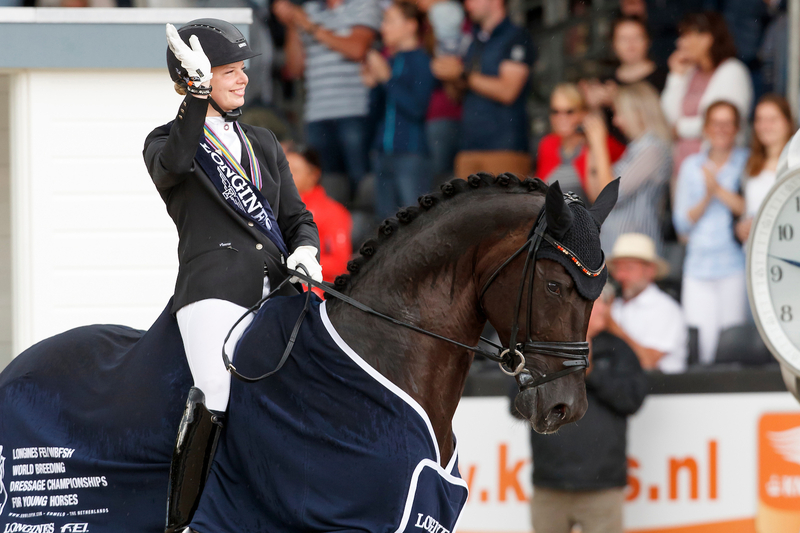 Lordswood Dancing Diamond lived up to his name when claiming gold in the 6-Year-Old division, the Hannoverian gelding bred by Heinrich Ebeling and owned by Bg Whitefield & Stack producing a staggering double of 10s for German rider Anne-Kathrin Pohlmeier in the final competition. In silver medal spot was the stallion Governor-Str whose sire is the legendary Totilas and whose mother is by Jazz, the horse that produced the glorious Parzival who posted so many successes for Dutch star Adelinde Cornelissen. In ninth with Governor-Str after the qualifier, double-Olympian Adelinde said that on the final day, “I knew that now I really needed to step on the gas so I took some risks, went for it, got it!” Bronze went to Spain’s Severo Jesus Jurado Lopez and Quel Filou OLD.